Wargame News & Terrain posted another of their reviews. This one's for Russian Alternative's Dwarves of Fire Canyon. 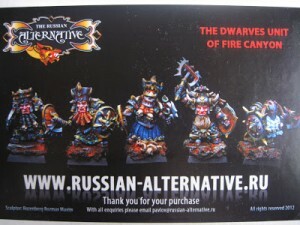 Wargame News and Terrain has finished a fully illustrated review of the recently released Russian Alternative Dwarfs of the Fire Canyon miniatures. Interested in these highly detailled heroic scaled dwarf miniatures for your chaos dwarf army or skirmish warband? Take a look.